In a first-of-its-kind class, four alumni artists returned to campus to teach the “Critique Intensive” class in the Department of Visual Arts. They focused on technique but also delivered some practical advice about life as an artist after Brown. PROVIDENCE, R.I. [Brown University] — On a snowy December evening, campus was quiet but the lights were still on in the second floor of List Art Center, where the Department of Visual Arts’ Critique Intensive class was having its last session. Mixed among the students in the large studio space were the class’s four instructors: Elise Ansel, Chitra Ganesh, Keith Mayerson, and Rob Reynolds. They’d spent the last 16 weeks with the class, taking turns teaching, critiquing work and leading discussions each week. But it wasn’t too long ago that the instructors occupied this same space as students instead of teachers. The four are now successful practicing artists working around the country. They returned this semester to teach and share their experiences in this first-of-its-kind class. Wendy Edwards, department chair, came up with the idea for the class after bringing several former students to campus for alumni shows, lectures, and panels over the years. She hopes this will serve as a model for future classes. “Alumni bring a generosity to their approach to the Brown students,” Edwards said. “They love coming back here, they love giving, and they’re very professional and committed to helping our students with their work and guiding them into the future. That guidance is at the core of the weekly classes at List. “I think it’s great for them to meet practicing artists and to be in dialogue with others who may have followed their trajectory — i.e., being at a liberal arts institution, an Ivy League school, and then choosing something disciplinarily that might be a little different or specialized,” said Ganesh, a 1996 graduate. The students, mostly seniors, were expected to produce a steady stream of work in the medium of their choice and bring those pieces in for discussion with their classmates and the instructor. Senior Rosa Congdon, a visual arts concentrator, said learning from someone who has walked the same path that she is currently on was a different experience. Congdon also noted that the class’s structure has allowed her to hone her critiquing skills — not only in the way she gives advice but also in how she accepts it. Andrew Alexander, another senior and visual arts concentrator, agreed that the intensity of the class was beneficial. While the weekly critique was the heart of the class, the alumni instructors tried to balance that with practical and theoretical discussion. That range of topics was on display one recent October evening when Reynolds, a 1990 graduate, was in the instructor’s seat. A discussion of the Patti Smith memoir Just Kids, which documents her relationship with artist Robert Mapplethorpe, brought up students’ thoughts on iconography, muses, and copyrighting, before shifting to some of the more personal issues they were wrestling with. “Are you doing what you need to do to become the fullest version of yourself?” Reynolds asked the group, before offering some advice to a few students who had expressed concern about their ability to make it in the art world professionally. “Take heart: There’s a big, thriving art market out there and if you want in, you can do that,” Reynolds assured them. Moving into the studio, the students took turns sharing their work, which spanned a variety of mediums, including paintjng, sculpture, and graphic design. Sally G. Kim’s doll-like sculpture of a female form was deemed “a breakthrough” and “less grotesque” compared to other works she had shown. Reynolds suggested the Brothers Quay, stop-motion animators, as possible references, and also brought up the idea of the student trying to cast some of her work in cement as a new approach. “I’m really encouraged to see where this goes. A month ago you didn’t know what you were going to do and it’s really come together,” Reynolds said. Evan Finkle’s multicolored graphic design incited a discussion about the historical applications and uses of the rainbow, while some students added that they didn’t like his use of a spectrum of colors and offered other ways that the student might approach the piece. The evening continued that way, with students offering constructive advice, while pointing out what the artist was doing well. Reynolds chimed in every so often, suggesting other artists for the student to take a look at or new materials to experiment with, all of it information the artists could tap into back in their studios, creating new works or continuing with these. The scene was similar at that final class several weeks later. As the students took turns presenting what would be their final works of the semester, the alumni instructors were quick to point out how each student’s work had evolved over the last four months. “This was the total culmination of what we had been looking for during the class,” Ansel, a 1984 graduate, said to Alexander after he presented a performance piece that included a poem, video, and floor installation. It’s that type of lasting effect that the instructors were hoping the class would have on the students. 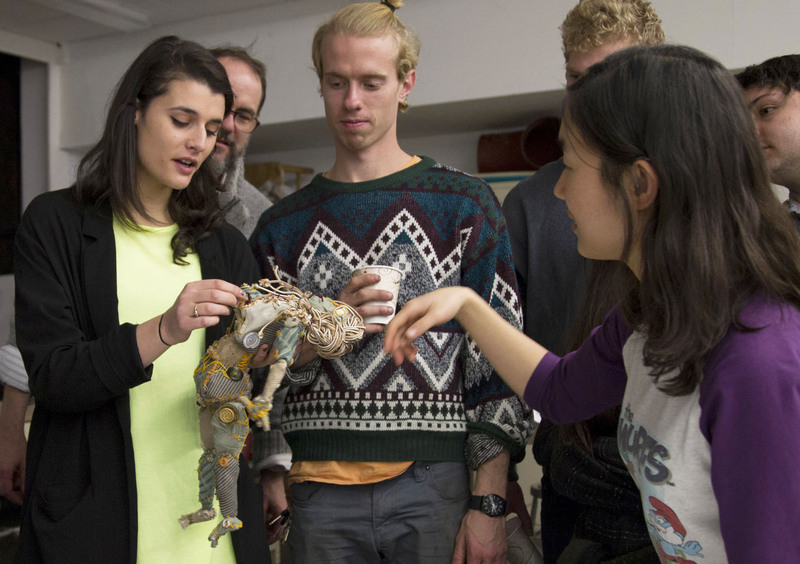 But beyond technique and critiques, they all tried to stress the importance of community-building and forming connections with fellow art students, which they said will help them throughout their careers.